My mother taught me how to make this simple and beautiful treat and I'm delighted to be able to share it. You won't believe how easy they are to make and how yummy they are! You will need two apples, half a lemon, three tablespoons of apricot preserves and pre-made pastry dough. This recipe makes six tarts. Carefully lay your apple slices overlapping in a scallop pattern along each strip, leaving room to fold the bottom half of the pastry strip over the bottom of the apple slices. 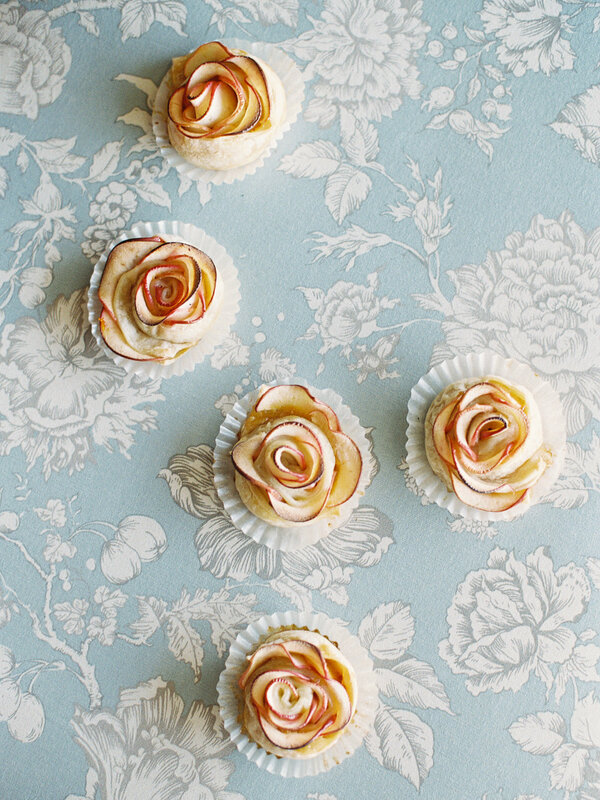 The round part of the slices should not be covered by the pastry strip, as they will form the petals of your rose. Starting at one end, carefully roll your enveloped slices into a spiral, like a cinnamon bun. Bake for 40 minutes, cool and serve. The oven will bake the pastry dough and cause the apple "petals" to curl and open. Enjoy!